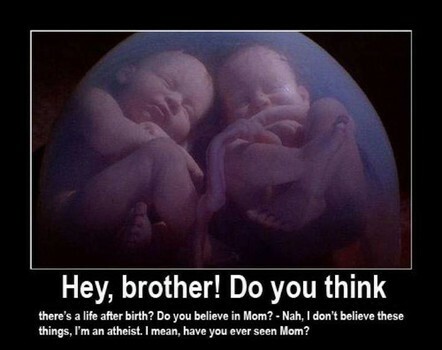 The proof of god’s existence? ‘You say you need proof of god’s existence, but the fact of the matter is that the proof is all around you. The fact that anything exists, rather than nothing, is proof that there is a god. In fact – you yourself are part of this proof. You are only here because of god, and now you’re saying that you need more “proof” of his existence? This is like claiming that you need proof that your parents exist – how else would you have even been here to ask this question if they didn’t exist? God is our heavenly father, without whom nothing would exist’. The way to begin debunking this argument is by pointing out that the assumption that a person did, in fact, have a mother and a father (even if they never met them) is reasoned through simple probability. As there is no credible case of a person NOT having been produced by combining a male sperm and a female egg (unless, of course, you happen to believe in bronze aged mythology), we can conclude that every person has a father and a mother. Could there possibly be, in some yet unknown set of circumstances, a person who does not have a biological mother and a father? Well, I suppose nothing is impossible, but since it has never been shown to happen, we can safely say that the probability of a human having parents is extremely high. Conversely, since we don’t see many universes being created by many deities on a regular basis, there is no basis in reason or evidence to suggest that the universe was created by a deity. And scientists like Stephen Hawking and Lawrence krauss have all but proven through reason and evidence that the universe could have very well, and probably did, begin from nothing. Yet another way to dispel the notion that god is like some kind of invisible parent is to point out that parents have parents of their own. In other words, if god is the parent of the universe then god must also have a parent. This is the classic infinite regress conundrum which the religious have never managed to solve. I have found that one of the funniest ways to handle the claim that the universe is proof of god’s existence is to ask your counterpart, which god? After all, there are thousands of them. Probably the most common answer you might hear at this point from your religious counterpart will be a silly ecumenical claim that all deities are essentially the same, and that the different names that different people’s gave these various deities only reflect cultural differences between people, not the existence of different deities. “In fact”, I have heard many counterparts say, “Isn’t this even more proof of how ubiquitous religion is, and how all peoples managed to reach essentially the same conclusion?” This is when things get even more fun because you can let loose with some gems from Greek or Norse mythology (read up on them, boys and girls). Why not ask your confused counterpart if he/she believes that the Olympian and Norse gods, or the Hindu and Shinto ones, are just different interpretations of what your counterpart calls Yahweh and Jesus? Is it not true therefore that Yahweh and Allah are simply different cultural interpretations of Poseidon, Vishnu,Odin and Quetzalcoatl? Is it not the case, therefore, that Christianity and Scientology are different names for the same thing? ‘You say you need proof of the story of Scientology, but the fact of the matter is that the proof is all around you. The fact that human souls are on earth, rather than on a different planet, is proof that Scientology is true. In fact – you yourself are part of this proof. You are only here because Xenu, the dictator of the Galactic Confederacy, brought your soul here in a giant DC-8 looking spaceship, and now you’re saying that you need more “proof” of this? This is like claiming that you need proof that your parents exist – how else would you have even been here to ask this question if they didn’t exist? Xenu is the reason you are on earth right now, without whom you wouldn’t have been here to doubt his existence’.